The Legend of Agnes is closely modelled on that of Clare of Assisi. The pregnant Constance also had a dream, which proved to be a clear message of what was to come. She seemed to enter a room in which her many costly regal gowns were kept; and she noticed amongst them a grey tunic and mantle and cord like those later worn by the Sisters of St. Clare. She was astonished and while she was wondering who could have put such a coarse garment among her precious gowns, she heard a voice that said: “Do no be surprised, the child whom you carry in your womb will one day wear that garment, and she will be a light to the whole kingdom of Bohemia”. At an early age Agnes was sent to the monastery of Treinitz, where at the hands of the Cistercian religious, she received the education that became her rank. She was betrothed to Frederick II, Emperor of Germany; but when the time arrived for the solemnization of the marriage, it was impossible to persuade Agnes to abandon the decision she had made of consecrating herself to the service of God in the sanctuary of the cloister. On learning of her decision the Emperor Frederick is said to have remarked, “If she had left me for a mortal man, I would have taken vengeance with the sword, but I cannot take offence because in preference to me she has chosen the King of Heaven”. It is not clear when Agnes came to hear of Clare of Assisi and her sisters. The first friars came to Bohemia around 1224 while Francis was still alive. But their first real presence in Prague dates from 1232. No doubt they would have told Agnes of the new groups of women throughout Italy. 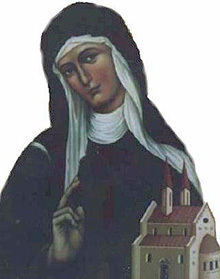 Agnes entered the Order of St. Clare in the monastery of St. Saviour at Prague, which she herself had erected. She was elected abbess of the monastery, and was a model of Christian virtue and religious observance for all. Although they never met, Agnes and St. Clare of Assisi kept up an extensive correspondence for two decades and four of Clare’s letters have survived to today. They breathe the spirit of that early Gospel life, and epitomize the heritage left to us, as to Agnes, by Clare. They also allow us to glimpse the rare and beautiful friendship that existed between these two women. God favoured Agnes with the gift of miracles, and she predicted the victory of her brother Wenceslaus over the Duke of Austria. The exact year of her death is not certain but 1281 is the most probable date. Agnes was canonized a saint by Pope John Paul II on November 12th 1989. At her canonization He said of her: “Agnes of Bohemia, although she lived in a period far removed from ours, still remains a shining example of the Christian faith and heroic charity, which invites us to reflection and imitation. She is an example of courage and spiritual help for the young people who generously consecrate themselves to the religious life; for all those who follow Christ she is a stimulus of charity practiced toward everyone with total dedication, overcoming every barrier of race, nation or mentality; she is the heavenly protectress of our difficult daily journey. To her we can therefore turn with great trust and hope”. The feast of St. Agnes is March 2nd. (Also called Agnes of Prague) was born at Prague in 1200. She was the daughter of Ottocar, King of Bohemia and Constance of Hungary and a relative of St. Elizabeth of Hungary.